every player and sports fan even wants to be in their respective hall of fame. 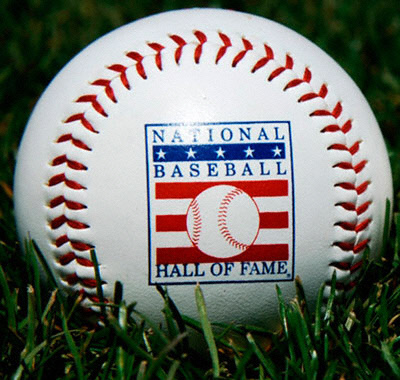 lately it seems like some of the hall of fames are under issues. for example, in the NFL HOF, there is always questions about art modell not getting selected as a great contributor or cris carter selected at WR. anyway, in the baseball hall of fame, my gripe is that it always seems like people get in after years of trying. how does this happen when the players stats don’t change after they’ve retired. the main issue here is the baseball writers association of america. the BBWAA is lame. many of these people vote on unwritten rules or made up issues about how they don’t like a guy or that they can’t vote on a first time balloter. a guy like cal ripken jr. doesn’t get a unanimous vote because one or two guys don’t vote for a first ballot guy. the guy that saved baseball and will have a streak that will never be broken. the guy that revolutionized the shortstop position and paved the wave for guys like jeter and a-rod. granted he also grounded into the most double plays in baseball history but if you played 2,632 straight games, you might have a bad stat or two. anyway, my point is that these guys are voting in players and most of them probably haven’t played a game since rec league if at all. and my main point here is that players who are on the ballot year after year go up and down and might eventually get into the hall because all the sudden these writers think it’s a good time that player to get in. for example, this year, barry larkin was selected as the lone member of the class of 2012. he received 86.4% of the vote, but just last year, he only received 62.1%. the year before that 51.6%. so how does a guy that wasn’t deserving two years ago and only half the writers voted for all the sudden garner a 80%+ vote by the same guys that said two years ago he shouldn’t be in? don’t get me wrong, larkin helped the reds win the world series in 1990 and has some nice stats. he was an all star, gold glover, silver slugger and NL MVP so why of all the sudden does someone completely change their mind and decide to put him in? it’s not like they had a stacked ballot last year for the election with roberto alomar and bret blyleven getting in. you can make this case for many of the people who have gone in over the years. this year as well the late ron santo was elected by the veterans committee. in 1980, santo received 15% of the vote. now with each voter only getting 10 votes and players like willie mays, al kaline, brooks robinson, and others getting elected in the late ’70s/early ’80s, i can see santo not getting in at the time but now he gets elected by the hall of fame veterans committee after not getting much support decades ago. anyway, at what point do we get a selection committee that puts people in based on merit and ability and not by a group of writers who make a decision on who knows what. it is prestigious and an honor to get into the hall of fame and i hope they would all vote that way. on a side note, according to wikipedia, the sports writers at the baltimore sun aren’t permitted to be in the group by their employers. i won’t say that the BBWAA is a joke, i just think there has to be a better way to select future HOF members. and who knows, maybe one day roger maris will get inducted. or jack morris. It is beyond me how Jack Morris is not in the HOF yet. The guy was the most dominating pitcher of a full decade and he still isn’t in. Sure he’s a little shy of 300 wins (he has 254), but he’s an absolute workhorse and one of the most feared pitchers of the 80s. Plus the guy had arguably the best World Series pitching performance ever. I don’t get it either. There probably won’t be any 300 game winners anymore either so something is going to have to change. Guys like Mussina (in 2014, I believe) and Morris would be next up. More than 250 wins but shy of 300. Time to take a fresh look. I just stumbled across this and, John Lee Bench was born in Oklahoma City, Oklahoma on December 7th, 1947 to Ted and Kathie Bench. Johnny Bench was a typical high school teenager who played both baseball and basketball at Binger High School in Binger Oklahoma. He played All-State in both baseball and basketball. Bench not only excelled at sports in high school but he also did well in class and graduated Valedictorian. Johnny Bench always wanted to be a professional baseball player and it was his father who suggested that he play the catcher’s position. His father felt that this would be the quickest way for his son to realize his dream of becoming a professional player. Johnny Bench heeded his father’s advice and in 1965, at the age of 18 he was drafted into the minor league by the Cincinnati Reds. He was brought up from the minors for the 1968 season to play for the majors beginning a successful career that lasted until his last game in September 1983. This year We’ve got one that’s right ONE Person going into the hall of fame.Now before when I said this I admit I had no one who should be in the hall of fame. But the more you digg into the history of baseball the more you find people who’ve had there rightfull place stolen.Take a look at Elston howard. One of the most regular World Series participants in history, he appeared in 10 fall classics and ranks among the Series career leaders in several categories. Carter was named to five All-Star teams. In his career he hit 396 home runs and drove in 1,445 RBI. yeah, there certainly a lot of interesting cases like these over the years. just weird and not good for the inconsistency. hope it all gets straightened out over the next couple of years. thanks for reading.